Women of reproductive age in Cambodia, and many other developing countries, comprise a large part of factories’ workforce. Integrating family planning and reproductive health information and services into factories can improve workers’ health and help countries achieve FP2020 commitments. 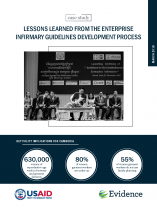 This case study looks at the process of how the Cambodian Ministry of Labor and Vocational Training launched, as formal policy, a set of workplace health infirmary guidelines for enterprises. What made this policy process unique for Cambodia – and what can be replicated by health advocates elsewhere – is that a group of organizations typically focused on public health policy successfully engaged on labor policy with a labor ministry. This case study describes the policy process, which was underpinned by the strategic use of evidence in decision-making and has been hailed by government, donors, civil society and industry as a success. The learnings presented in this case study should be useful to health advocates, labor advocates, and program designers.